Finally Did The Thing. Watch Now! I’ve always had a story idea or 5 running around in my head. Most of the time, I’ll write them down and try to make something out of them. Sometimes it’s good, sometimes it’s bad, sometimes I think it’s bad but other people think it’s good. I love to tell stories, but I also love to procrastinate. I’m an artistic person by nature and there are so many interesting DiY art projects to try. Some of them seem impossibly easy while others just seem downright impossible. When I can’t quite figure out how a story should go, I usually find another artistic endeavor like resin, paints, or clay. Sometimes I leave the artistic world and just find new recipes to make. So, the point of this rambling is that I’ve decided (more than 2 years ago) to start a YouTube channel. At the time, I didn’t quite know what I would do with one. I could be like other writers and offer up some advice and try to teach, but I don’t think I’m quite up to that level yet. All I can do is offer up my support and love. Maybe that’s a lesson to teach all its own. I considered doing puppet shows, which I still may do, but I didn’t have a working concept for it. It suddenly dawned on me that all my “planning” and “brainstorming” about the issue was really just another form of fear. My fear of being seen, of failure, of exposure, but if I want my stories out there, I need all of these things. I finally decided that I could find out what I was going to do with the channel later. First, I needed to get out there and get over my fear. Not many people will see the first videos anyway and I needed to put myself out there, like a hungry bunny in a hawk infested area. The first few videos I had planned involve reading some short stories of the past over video of the experiments I’m procrastinating with in a series simply called The Procrastinating Writer. It’s my hope that once I get more comfortable with myself and what I’m doing that I branch out to the real thing I wanted to do. Everything in life is a learning process. Without further ado, my first video. So, yeah. Anyway, there’s still plenty of time to vote in the 2019 TCK Reader's Choice Awards. Just click here, the link will take you to the voting page, A Warrior's Path: Rise of a Legend is on page 8, 19th selection down from the top. And if you feel so inclined, check out the books tab, scroll down, and get yourself one of two free book, or both. Inspire, motivate, believe. Together we can change the world. Let’s all work together to make a better place. We can be each other’s cheerleader. We all rise together. It sure has been awhile. Gotta love my consistency. I haven't really been keeping up with the stuff I said i would (no kidding), but I did drive out of town on a rainy day, because of course we did. Why is it that every time I have to drive pretty much anywhere out of town with Ma for anything there’s some sort of inclement weather? Ma had a doctor’s appointment out of town because that’s where all the specialists are, but per our usual luck, there was a storm on the way. According to the weather apps, it would be chasing us out of town if we hurried after the appointment so I had high hopes. Shame on me. The really odd thing about it all is that even though the sky turned black and the rain started falling faster than the wipers could clear, we actually did miss the worst parts. We left Albuquerque around the time when people are getting off work, so I already knew traffic was going to be a mess. The rain started and stopped like it always does. It was either nothing or the entire waterfall. It seemed that most of the drivers didn’t care that the ground was wet or that visibility was low, or that the wind was high, or that there were cars in front of them. So completely normal. I’d say I almost got run off the road a few times, but I can stand with the best of them. They’ll either wait for me to get out of the way on my own time or they’ll get tracked down and arrested for murder. Passing semi trucks was no day at the beach. They kicked up a lot of water that made visibility even worse. All I could think to tell myself was that I knew the road was there and if I made it to the front wheels I could see again and all would be well. So I popped a Mentos (not sponsored) and pressed on. (Mentos do not increase your bravery or improve your driving skills, they’re just minty and delicious) Driving blind isn’t fun. Around one of the towns, a police officer flew onto the interstate and took off down the road. I watched him for as long as I could. 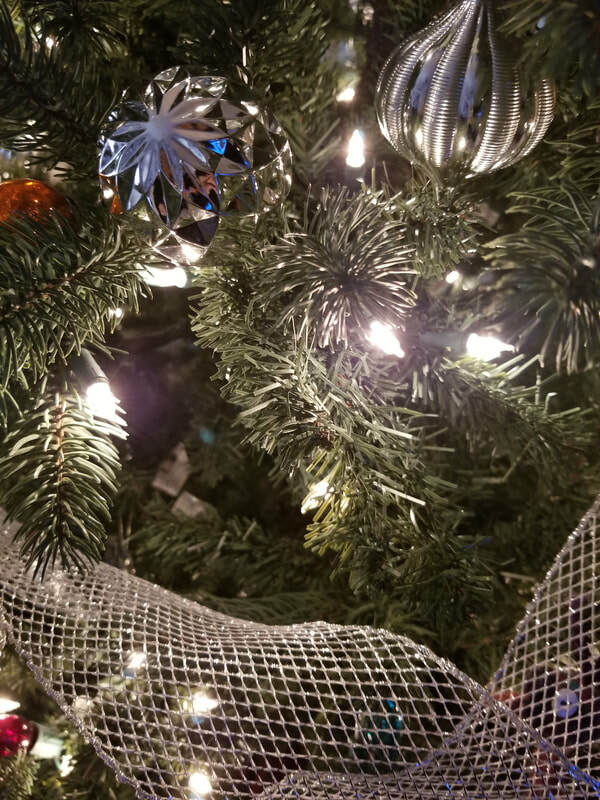 I liked the fact that there was something I could easily keep track of all the way off into the horizon because his lights were so bright, but I could only watch him for a little while before he was gone. Somewhere down the interstate I came across a large group of vehicles. The big trucks were in a line waiting for the other vehicles to get around, everyone recklessly jockeying for the best position while one two people held them up, one slowly passing the other. I decided to take a bathroom break. I obviously wasn’t getting around them anyway. When we got back on the road, I found out where the cop was going. Seemed there was a silver pickup that had rolled over, either due to the rain or the wind or maybe both. As I came into the area around Santa Rosa, the sky started turning black. Everything was getting darker and darker filling me with an ominous feeling. I could feel something dangerous in the air and I wanted nothing to do with it. Fear tends to make me want to rush, but there was no rushing when the wind kicked up higher than before while the puddles in the road threatened to pull the tires of the car out of my control and the clouds dropped buckets on everyone driving. I kept focused on the back lights of the car in front of me and pressed on. Slow was the only way to go. As we entered into another county, Ma’s phone went off notifying us that there was a tornado in the area, take shelter now. I was hoping it was in a different area since her GPS wasn’t turned on, but I knew better. Smartphones always know where they are. Of course, I always wonder where one is supposed to take shelter when they’re literally in the middle of nowhere. No houses, no businesses, no ditches, just a side of the road in a car. And if my only shelter is a car, I’m going to keep moving. We’re basically in a steel roll cage. I think car frames are still made of steel. That’s gotta be safer than being out in the open, right? My phone has the GPS on so it’s more pinpointed to an area, so when mine went off as I watched the winds increase even more sending lines of water shooting across the road, I got even more scared than that time Ma made me drive home during winter storm Goliath. The tornado was coming. I mean, we lived, obviously. I was just really tense all the way home. I never saw that tornado. Not sure how close we were to it either, but that’s the kind of energy that anyone can feel. It just screams danger. A friend of mine said she didn’t know which trip was worse, the snow storm or the tornado. I’d still go with the blizzard because I never got stuck in the water and I only had to slow down for a few miles at a time. This trip took a little over 4 hours (an hour over normal) versus Goliath that took 15 hours (10 hours over normal), but I think driving next to a tornado is a pretty close second. Anyway, there’s still plenty of time to vote in the 2019 TCK Reader's Choice Awards. Just click here, the link will take you to the voting page, A Warrior's Path: Rise of a Legend is on page 8, 19th selection down from the top. And if you feel so inclined, check out the books tab, scroll down, and get yourself one of two free book, or both. There's still time to cast your vote in the 2019 TCK Reader's Choice Awards. 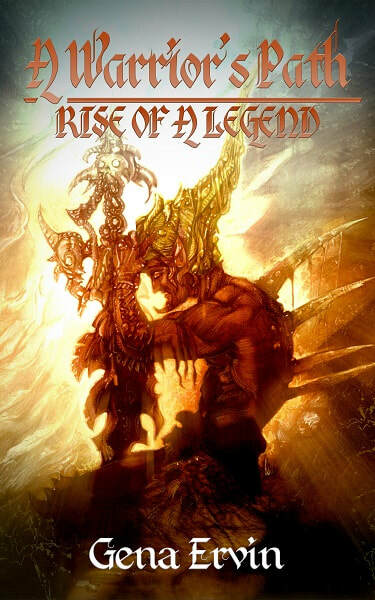 The link will take you to the voting page, A Warrior's Path: Rise of a Legend is on page 8. See another book you like in another category? Vote for them too. Everyone appreciates a little support now and then, and this won't cost you a thing. With that out of the way, I thought I'd share a little love letter with you. It's a letter for me written by me. We all need to learn to love and appreciate ourselves. Too many people out there constantly give of themselves and never take the time to give themselves the time they need to heal and breathe. I don't have a significant other, and that's okay. I can sing praises of everyone in my life, but I never want to talk about myself. I need to learn to love myself first before I can love anyone else in that way, and a letter to myself is a good place to start. It was surprisingly hard to start. I'm not my biggest fan. All of my insecurities started to come out at just the thought of giving myself any praise. But I pushed through because I think it's a good exercise for me. Maybe I'll be more comfortable networking and trying to get my work out there more if I build up more confidence in myself. You’re pretty amazing! You’ve gone through life trying your best even when things don’t go your way. You’ve helped others as best you know how and you’re always trying to get the world to laugh and share their hearts with others. Sometimes you succeed in your endeavors, others you don’t, and even then you still walk around with a smile on your face, a song on your lips, and the belief that one day they’ll be a love in your heart meant just for you. 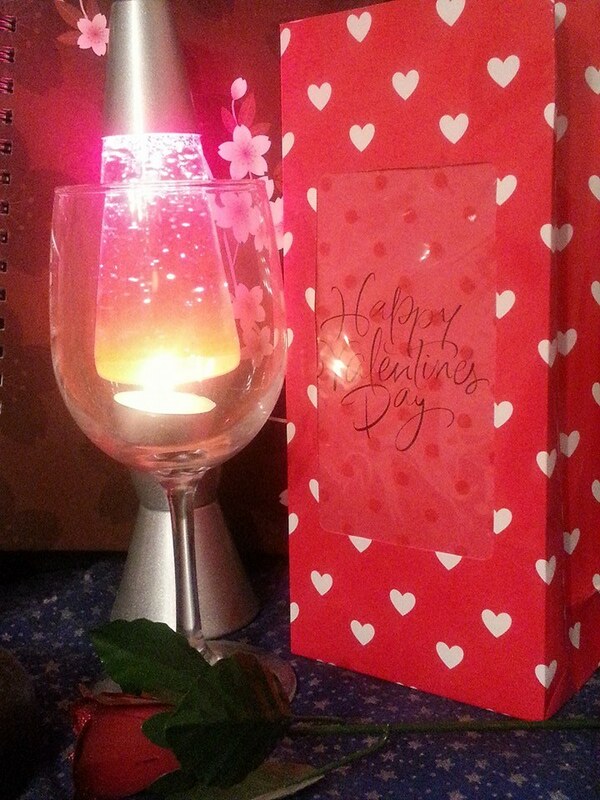 Even though you’re still waiting for that special someone, you’ve been loved by many through friendship and family. Even strangers can see how amazing you are. What I love most about you is that you never give up. There’s a calling in your heart and even though the road is tough and there are so many rejections along the way, you keep the faith that one day it’ll all work out for the best. You believe in the power of yourself, that persistence and dedication will eventually pay off in the end. You know that there are forces at work that reward such dedicated behavior and you express gratitude for all help (physical and spiritual) every step of the way. Even when there are some who try and stop you from your goals, you fight on. Even when there are those who try to tell you it’s not worth the fight, you persist. You know that even small steps forward are still steps forward. Your mantra is what Lao Tzu told you “the journey of a thousand miles begins with one step.” And slowly step by step you move. Small progress is still progress. You are a strong, beautiful woman with a kind and loving heart. You may not have that romantic love you’re looking for, but you’re completely surrounded by people who adore you, and that’s no small feat. So stop trying to force your heart to love someone in that way. Love comes in its own time in its own way and is different for everyone. I love you just the way you are. Amyway, I drove Ma to Santa Fe over the past weekend. 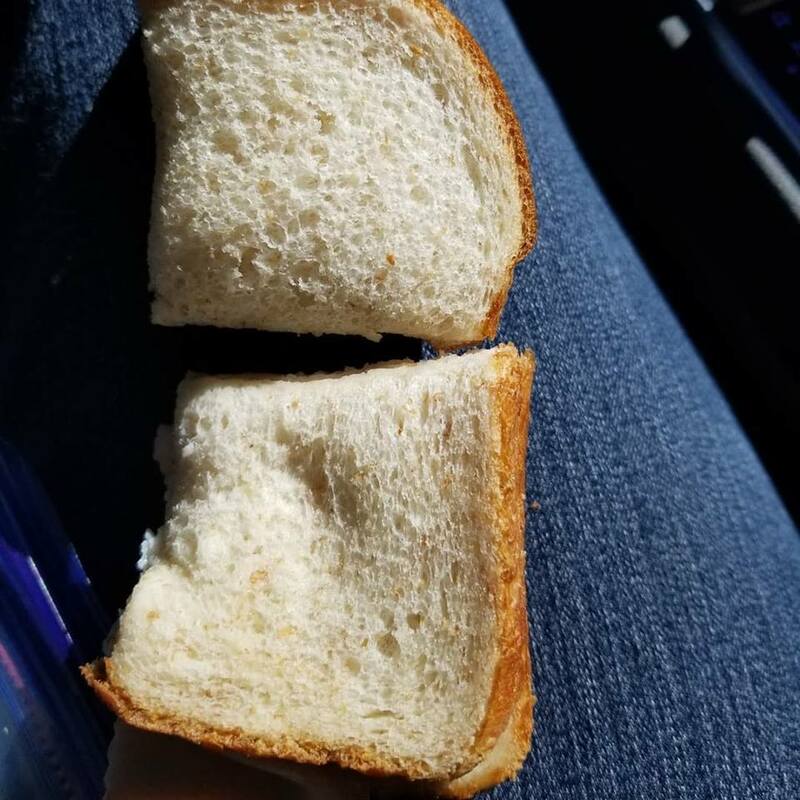 We can't go anywhere without some food in the car so she made sandwiches. She cut mine into tiny squares. She's the sweetest, best mom in the world even though I teased her about the cut. I may not be a baby, but I'm her baby. And even though it was only filled with turkey and Miracle Whip, it was the best sandwich I've had in a long time because it was filled with her love. She's the reason I don't completely hate myself. She's always been there to lift me up when I'm down and encourages me even when I insist I'm no good. Thanks, Ma. Anyway, there's a bit of mush for you lovey types. Tell the people in your life how much you love an appreciate them every chance you get. You never know when it'll be your last. Oh, and go vote in the 2019 TCK Reader's Choice Awards. The link will take you to the voting page, A Warrior's Path: Rise of a Legend is on page 8. And if you feel so inclined, check out the books tab, scroll down, and get yourself a free book. It's time for the 2019 TCK Reader's Choice Awards. Vote for me! The link will take you to the voting page, my listing is on page 8. See another book you like in another category? Vote for them too. Everyone appreciates a little support now and then, and this won't cost you a thing. Was that title a little click-baity? Sorry. Here's a picture of some cats that aren't mine. At least, I think there's some cats underneath all that fur. They meow like cats. I did take the picture, though. ​Inspire, motivate, believe. Together we can change the world. Let’s all work together to make a better place. We can be each other’s cheerleader. We all rise together. I bet you thought I forgot. It's technically still Monday for a few more hours. It's technically still 2018 for a few more hours, for me at least. 2018 was a pretty cool year. If I ignore the fact that there's a loud, chatterbox in my house that shows no signs of ever leaving, it was pretty decent. I had a book published this year (click on the image for Amazon listing) and my first ever book signing event that people actually showed up to! That was such an amazing experience. I also got to go see a comedy show that I've been dying to see ever since I saw he was going on tour. I meant to do more things, but I think I shut down a bit there in the middle. It happens to all of us sometimes. For the upcoming year, I plan on doing more things towards my dreams. I probably said that last year, but if I can do one thing every day, then 2019 will be even better. I plan on not sweating the small stuff, like not letting people get to me. I need to ignore those people when I'm doing something for myself. I need to learn that I matter too and it's okay to do things that are good for me and my future. I need to learn to love me and to take care of me. I also need to stop spending so much time on YouTube and spend more time writing. Staring into the blackness of the void, not a single celestial body in sight, I felt like we were alone, trapped on a seemingly never-ending road of misery. The headlights lit the way showing the snow covered trees off the side of the road. The wind whipped around us, threatening to push the little blue sedan from the road and down into the depths of the snow filled cavern below. There was surprise and shock as the wind picked up hurling a small tumbleweed that looked insanely similar to an “Alien” face hugger at the front of the car. Groups of cars that occasionally appeared from around the mountain trail were a comfort, a break in my loneliness. Driving in a snow storm is no fun at all. I though back, hoping to fill my head with a bit of joy from the fun family times we had not two days prior. We paid a visit to my brother’s kids over the Christmas holiday, a trek we make every year. We watched some movies and had some nice quality time together. Ma wanted us to go see the River of Lights in Albuquerque. So, the day after Christmas, we drove up that way. ​Along the way, we made a stop in a convenience store. The bathroom was broken so I left to go to a different store across the street. I backed out of the spot and the boy child said “aren’t we forgetting someone?” I looked over at his sister and then to the empty chair and it actually took me a moment to realize that I had left Ma in the store. In my defense, she said she didn’t have to go and planned on staying in the car. I had to park the car again and go in the store looking for her. 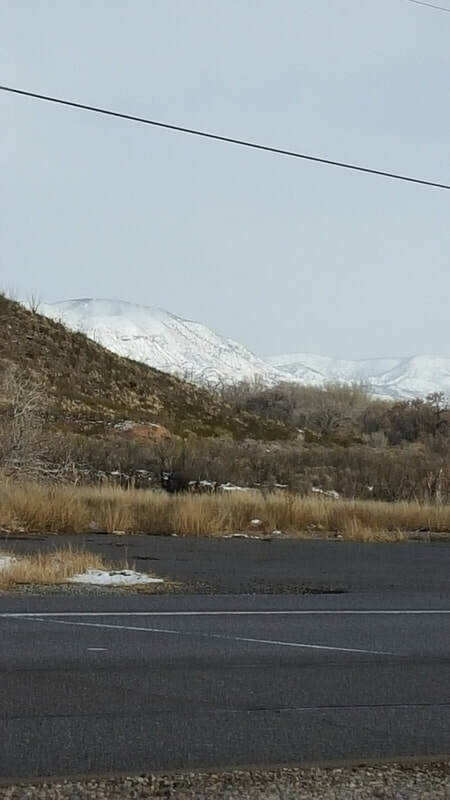 It started to snow on our way to Albuquerque, but I was still hopeful that the drive wouldn’t be for nothing. It was for nothing. The snow fell in such a way that the sidewalks were covered in sticky slush that fused into the grooves of our shoes and caused us to slip after just a few steps, and the ABQ Botanical Gardens are mostly sidewalks, so we didn’t go. I was the only one willing to go out in the cold anyway, because it wasn’t really that cold to me. Outvoted 3 to 1, we drove all that way just to stay in a hotel. ​It seems that the signals for Century Link, Verizon, and Direct TV went down that day throughout most of the state so we were all on our phones. Thank goodness for Dish Anywhere (#notsponsored). With Dish Anywhere, Ma was able to watch all the live TV shows she normally watches at night so she didn’t miss a thing. I should’ve been writing, but I watched YouTube vids, because of course I did. The next morning was time to drive all the way back. The Direct TV signal was back for a bit and I heard that there was another storm coming that was going to be even worse than the one before. 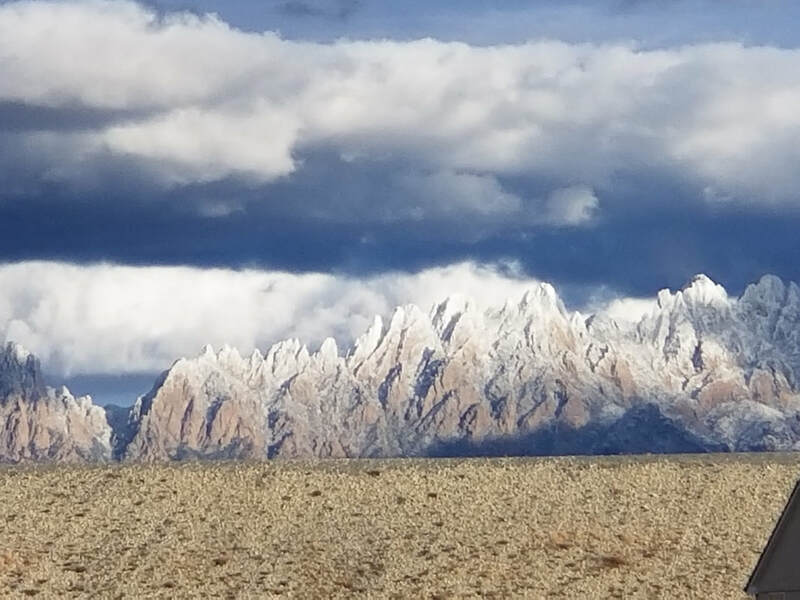 I checked the NM roads map and saw there would be difficult driving conditions through about 10% of the drive, so I wanted to make sure I got through that pass before the next storm moved through. Once in town with the kids, we went out for one last family meal. The girl child squeezed the ketchup bottle and it made noise. Naturally, I laughed. The bottle farted. She said “I thought we were more mature than this.” I replied with “you thought wrong,” because I’m clearly not a mature person. At least not until I absolutely have to be. We said our goodbyes, and it was time to race home in the dark. I’m glad I made that drive half asleep in the dark because the next day I heard that over 90% of my trip would’ve had very difficult conditions and I probably would’ve panicked with Goliath flashbacks. So that was the trip. Not very exciting because we spent so much time just hanging out watching TV or at the movies. It was time we spent together so that's all that matters. Anyway, last post of the year. Hoping for even more and exciting posts for the future. What are some of your resolutions for 2019? How do you plan on achieving those things? ​Let's all make 2019 our best years ever! It's cold. That's why I hate snow. It's cold and gets everywhere, like sand only cold. I don't really think I've ever liked the snow. You'd have to ask Ma to be sure. It seems that the year I was being formed there was a snow storm that covered the top of our family van.Ma likes to ask if I remember that storm and I tell her yes because I was hanging out in her womb, sitting back in my recliner with a cup of cocoa looking out of her belly button at it fall. There was another year when I was a baby and we were driving together as a family trying to get to Ohio. 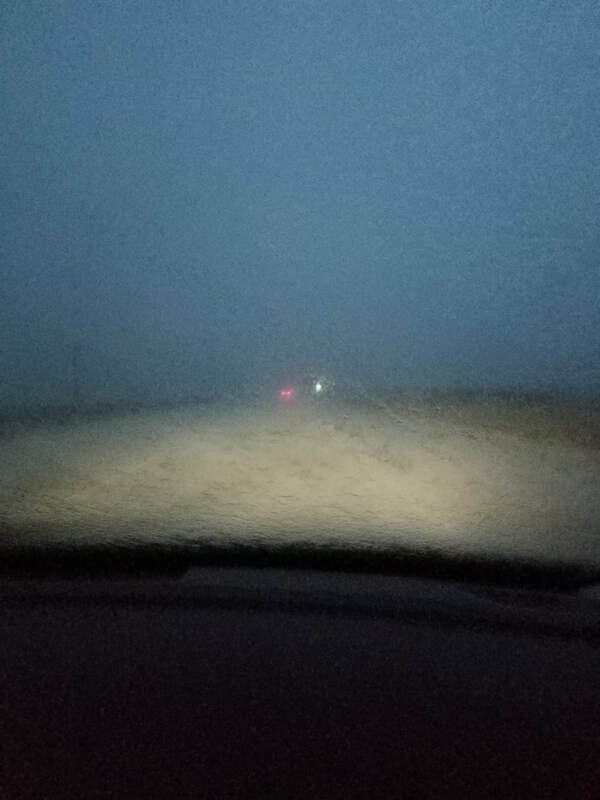 Maybe I picked up on the tension and/or fear as we drove through the dark on slick roads with low visibility. There was another time long ago when it snowed a lot and my brother stayed outside because he was building a snow cave, even after it started snowing again. He kept coming back in for water to reinforce the walls. I'm glad that thing didn't cave in on him because no one knew exactly where he was until it was finished and we had to come and see his masterpiece. It was pretty cool in there (pun intended). It protected from the wind so it wasn't freezing. It would've been a nice place to just hang out while the blizzard started to increase outside, but I don't like enclosed places for too long and Ma wasn't about to let her babies stay in a snow fort during a blizzard. Anyway, we had a nice little trip this Christmas, but in the interest of having more things to post about to get me back on the Monday post track, I'll put that story up on Monday and instead share with you that time I thought snow was going to kill me. Around the same time three years ago was Winter Storm Goliath, and it did its absolute best to live up to its name. It was two days after Christmas 2015 and Ma and I were ready to drive across the state back home. The problem with that decision was that it had snowed the day before, the largest snowstorm in years. Winter Storm Goliath they called it. 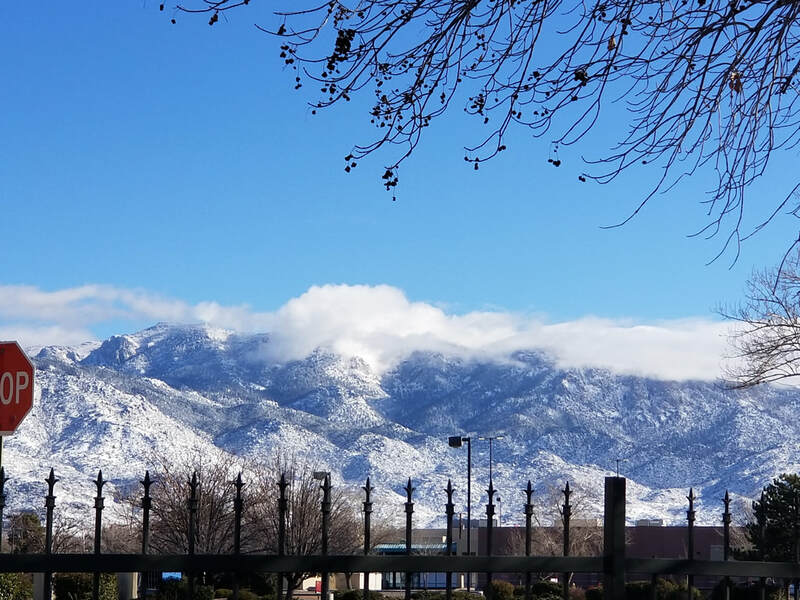 There are people out there who are saying things like “why would a little snow make a difference?” To those people I must inform you that New Mexico is not a state that’s accustomed to snow, especially that much. Sure there are ski resorts here and a few towns that have those elusive machines known as the snow plow, but not everywhere in the state does, because those areas don’t know what snow is. The snow fell all night and the department of transportation advised the public that if they didn’t have to travel, then don’t. Ma heard all this and insisted on leaving anyway. My recommendation was to tell the hotel that we wanted to stay another night. It was cold and icy, but not so bad in that town and the hotel had told us that they had the room if we wanted one more night. For whatever reason, she really wanted to get home, so off we went. It was slow going coming out of the floodplain city and 70 miles to the basin. But once we were down that side of the mountain, things really cleared up. It was almost as if it never snowed at all. 14 more miles to the next little piece of civilization and we were forced to stop. ​Driving on a flat sheet of ice with the occasional turn actually wasn’t so bad. I found it hard to believe why this particular road was even closed, but it was a straight sheet of ice and if the car ran off the road it would fall down a hill and possibly flip. Driving this was fine, but after 81 more miles I needed to stop. It was more of a just in case pit stop. Might as well go since we’re here type of thing, and it was a good thing we did. Off on the road to our next destination on another highway, someone got stuck. Stopped on the highway, we waited for someone to come out and rescue the stranded motorist. The line down the highway grew for what looked like miles behind me and already looked like at least one mile in front of me. After four hours, we were all on our way. We pulled into a gas station for snacks and a map. Ma looked and saw we could vector north, so we did. That road wasn’t bad at all, at least not for about 45 miles. We stopped at a, or should I say the only, convenience store in the area for a quick rest and to top off the tank. The road continuing our journey was closed, that is it had a barrier in the middle of the road with a sign on it that semi trucks and other cars were going around. Ma said if they could go around it, so could we. So, in the middle of the state where cell signals are few and far between and half a tank of gas can get you stranded, we pressed on. Travelling down the highway in the middle of a caravan made me feel sort of safe, because we weren’t out there alone. The cars in front would pack down the snow so the car I was driving could safely traverse, as long as I followed their path. The sun had set while we were waiting, and driving in the dark has always been a bit of a chore for me, but we made it safely down the next 58 miles. Some of the caravan continued, some of them stopped. Inside the convenience store, we all commented to each other about things: where were we going, where were we from, the benefits of those with internet in their cars and at least one bar cell signals. It was a fun moment. Of course, ultimately everyone was only out for themselves in the end. Understandable I suppose. The lady at the counter mentioned that a church and the school gym were open to travelers to keep them off the roads. I was ready to quit and get at it in the morning, but by this point we were only an hour from home. It was as quick a stop as each individual car could make and we continued in small caravans if we were quick enough to follow one down the highway. I followed that caravan. We weaved back and forth to avoid the occasional large snow dune. Seems everyone was heading east. The two lane highway had little to no westbound traffic. At one point, we were stopped by someone who got stuck. Instead of helping them get unstuck, members of the caravan only moved them out of the way. They were only out for themselves after all, and by this point I was too. The road finally splits into a four land highway for awhile, two lanes each way, and I started to speed. We were so close. A snow plow made its way by us, most likely to help clear streets in town. I couldn’t decide which street to take to make it across to my area of town. I figured the usual way would be blocked and dark, the other common way would be even worse with its one street light, so I kept to the main roads leaving my caravan to the highway. I hope they all made it home safely. 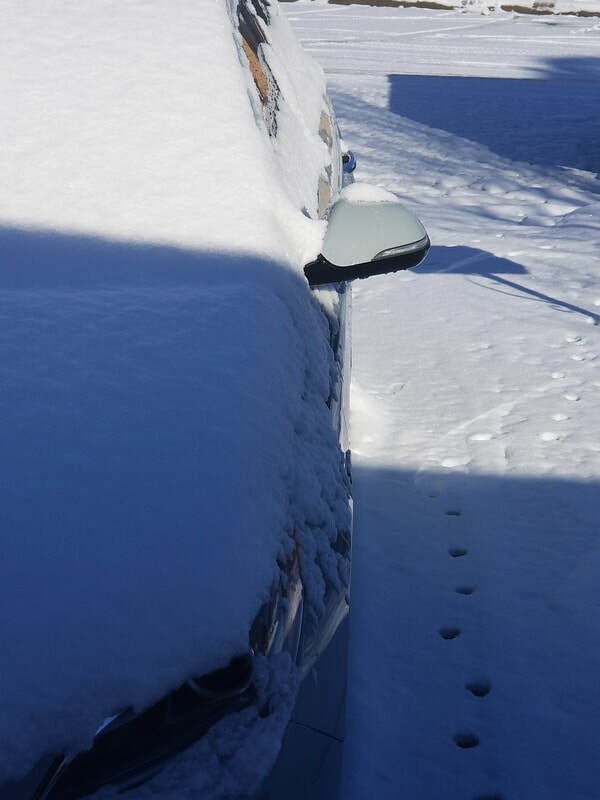 I made it over a few patches here and there, but one snow drift was a bit too high for the rental car. It tried its absolute best to get over it, but the bumper was too low. We were stuck. There were a couple of guys in a bigger truck that drove by, but it was clear they weren’t going to help. The wheels spun wildly as I tried to get us unstuck, but we weren’t going anywhere. Just as I was ready to cry so close to home, a guy came out of his house on the corner and started to push. We worked together, him pushing and me on the gas, trying to rock the car back and forth. His wife came out and we all tried. We shoveled some snow from the front trying to get the drift down. At one point, he got into his small truck that may as well be a midsize car, and tried to push. He kept trying until his engine was ready to overheat. The wind was high and the cold biting when I got out to push. On a normal night, I probably could’ve walked home and grabbed one of the older cars to go back and get Ma, but the wind was so high that it was hard to stand and the temperature so low that my hands lost feeling in two minutes in gloves. Just as we were all ready to call it quits, I found new determination to try again. We were so close to home. I rolled that car back in the groove we created and slammed the gas to the floor. I kept the pedal pushed down unrelenting and listened to the engine roar, hearing the tires squeal against the ice, letting the car shift lightly from left to right. I kept that pedal down believing that we’re either getting out of here or I’m burning out the damn engine block. I rented that car, what did I care? Then, out of nowhere, it slowly went up and over. We hugged that man and his wife before moving on. Onward with Ma at the wheel. We turned down a street we hoped would get us across town. There was another snow drift and Ma chose to go over it carefully rather than attack. We got stuck. I was greatly weakened from the previous drift but tried anyway. Pushing was pointless by myself and Ma just didn’t get that I wanted that pedal pushed down to the floor and for it to stay there. Not two minutes later, someone drove by. It may have been the same people from before because it looked like the same truck. Those two young men got us out in no time and told us of the flatter areas in the road. They said they’ve been out driving them all night. I thanked them and we turned around. Cold, hungry, and scared out of my mind, I drove back to where they had said. I couldn’t see the spot they were talking about. The entire road looked exactly the same so I hung out in a convenience store parking lot that decided they didn’t want to be open anymore. Those guys drove back our way and lined themselves up with the opening. He flashed his lights at it and then took off as if to show me where it was. Reluctantly I followed and we were on our way. I weaved on the road across town avoiding the snow drifts. Things were going fine until I turned down my next street and saw snow across the entire road along with a car that was stuck and a snow plow that was going to get it out. There was a black SUV on my side of the drift and he rolled his vehicle up over a curb and into the parking lot to get around the drift. I followed his lead but then he backed up and signaled for me to go ahead. It may have only been five minutes from home, but I was tired of driving, my eyes couldn’t focus enough to get us anywhere and I didn’t have strength enough to keep trying, but I know a cop when I see one, marked car or not. I asked him and his partner if they could drive us home. He said hop in. I parked the rental somewhere under some light and off we went over piles I’m sure I could’ve gone until we turned down another street. It was covered. The officers had to pull two full sized pick-ups out of their snow traps before getting us closer. They turned down our street that was nothing but snow and ice and dropped us off at the door. It was supposed to be a less than four hour drive that was turned into more than thirteen, but I found help the entire way. 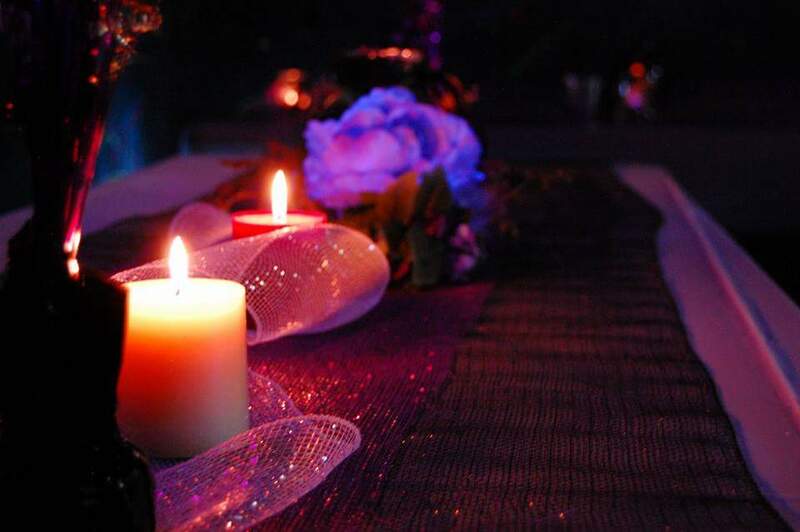 I didn’t eat and hardly drank, but when I got into the warmth of the house, I was just too relieved and tired to care. I’m just so glad that the universe watches over me, especially when I’m being an idiot. So that's what happened three years ago. I'll have a more recent and much less traumatizing story to tell on my regular upload day (hopefully). But this is definitely the reason that now, any kind of falling snow fills me with so much anxiety. I was doing so well there for a second too. Oh well. It's the holiday season and I haven't been doing anything. Mostly annoyed by the "guest" that's been in the house since January 2. She lost her house so the plan was that she stay for a few weeks until she found another place, it's December. She's still here. Her presence annoys me because she's the type of person who has to talk all day every day and I'm the type of person who likes to sit mostly in silence and talk to no one except maybe a few days out of the month when I start to feel lonely for human contact. If she's not talking, she's making noise. I swear, the other day I was ready for murder. She was talking to Ma the previous morning, then most of the evening, and then woke me up the next morning. I hadn't been sleeping well as it was, possibly because of the energy of the meteor shower, and waking up to the sound of her obnoxious voice set me up to be angry all day. I was fine for awhile thinking she had talked out all she needed to until she came in around noonish to talk some more. That set me off and I had to leave the house. Luckily, I have a really great friend who understands that sometimes we experience pure rage. I hung out with her that afternoon and played with her super fluffy cats that I'm allergic too. I don't remember ever feeling that much rage. That's a problem. Perhaps I should meditate. Being annoyed has messed with my creativity, but I see it as a lesson in self control. The fact that I haven't ripped out her vocal chords yet prove I have some sort of control, but now I need to learn how to block it out. She's very loud and hard to ignore, so I'm getting some noise cancelling headphones in a few days hoping that'll help block out the nuisance and increase my desire to write more. Of course, this could all just be me too lazy to write anything and wanting to pass the blame on to someone else. Anyway, like I said, it's the holiday season. I missed out on Hanukkah, but I'm thinking I'm going to offer up Bridge of Destiny e-book for free again from Yule to Christmas Eve. I have a few more free days available. I'll let you know when I decide the last few dates I have for that this year. Give the gift of adventure this year! 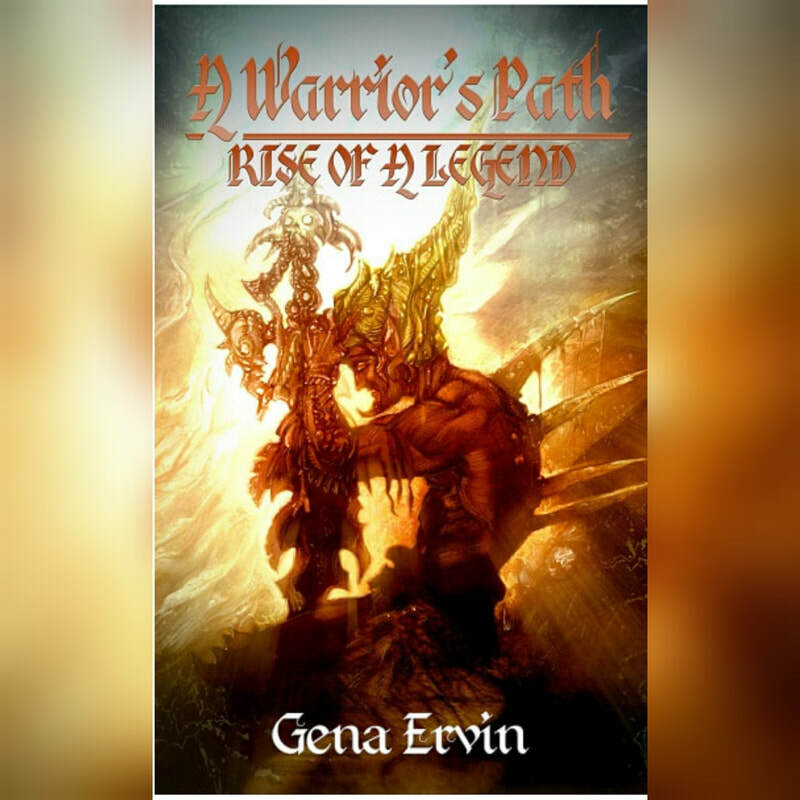 A Warrior's Path: Rise of a Legend has been reduced so now's the time to buy. If you want it by Christmas you better hurry. Amazon only has 4 left in stock. Ok, shameless plug out of the way. Enjoy your holiday, whichever holiday you celebrate. Personally, I want to celebrate them all because each celebration holds something different. In the interest of having a Cyber Monday sale, starting tomorrow and only for 2 days I'm offering my already low priced e-book, Bridge of Destiny, for FREE! No strings attached. I just hope you enjoy it. Of course, if you do enjoy it, a little review would be nice. You don't have to if you don't want to, but they really help me out. 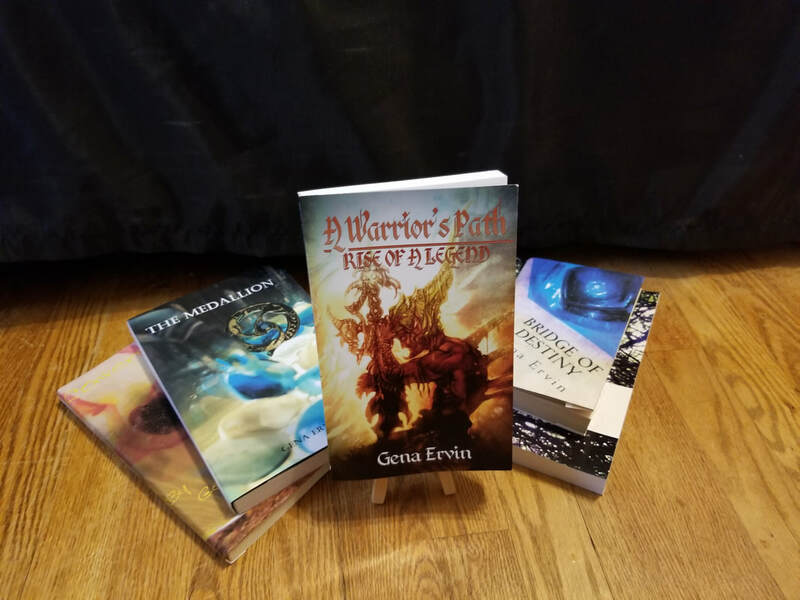 Be sure to click the books tab to head straight to a list of all my books including other free books and my newest published sensation, A Warrior's Path: Rise of a Legend. So check them out and let me know what you think. I knew it wouldn't last, but at least I gave it my best shot and have no plans on giving up. Isn't that the thing that truly matters? So I skipped a few weeks. I've been working on and through some things. Not always sure what's going on. I think I just get too wrapped up in all the things that need to get done and how I'm going to tackle the mountain that I don't do any of them. Things work out just fine when I stack them up and work on one thing at a time, the trouble is that I never know which thing should take precedence. Anyway, the hose on my kitchen sink got a hole in it and the replacement hose arrived today. Super easy to install so my faucet now looks more like a faucet and less like a limp noodle. So that's cool. I've also entered a few more contests. Fingers crossed. Things are thawing out after the brief snowstorm that happened the other day. I like looking at snow, but I hate trying to drive in it or being too cold. I mostly like taking pictures of icicles. If you find a really interesting spot, things start to look like secret ice caves that have been lost to time on a frozen tundra. Okay, well, I guess I didn't really have much to talk about. I mean, I probably do have more to talk about, but for the life of me I can't remember what it was. I should really just type away on this blog when I get an idea and not on a specific date so I remember. I'm not going to change that, but whatever. I always keep trying.